A good Samaritan finds himself locked in a nightmare in this book, the third novel by crime author David Goodis. He is a man who has experienced the grave misfortune to have been exactly in the wrong place at exactly the wrong time. He is also the subject of a three-city manhunt, wanted for murder and for bank robbery, and according to the evidence, is guilty of both crimes. But Nightfall goes much deeper, examining two men who ponder the roads they've taken in their lives. As the novel opens, it's a "hot sticky" summer night in Manhattan, and Jim Vanning, a WWII Navy veteran, now working as a freelance commercial artist at his home, is feeling the heat. As he stares out his window, "looking upon Greenwich Village, seeing the lights, hearing noises in the streets," he decides that he'd really like to get out and go talk to somebody. But he's also afraid to leave his place -- he knows for a certainty that if he goes out, "something was going to happen tonight." His gut sense of danger proves correct -- a chance meeting with a young woman in a Village bar leads him right into the path of three very nasty characters who want something they think he has. The problem is, he doesn't have it, and has no idea where it might be, since his mind only sends him fleeting images of that part of his past. Even when they rough him up and some memories start to surface, he still can't remember where the object is. Recently discharged from the Navy, Jim Vanning decides that he's going to take some time before going to Chicago, where a job awaits him along with his dreams of someday getting married and starting a family. First though, he's going to go to Denver, and sets off from Los Angeles in his newly-bought convertible. On the road, he comes across a station wagon that has just been in an accident, and being the good Samaritan that he is, he gets out to try to help. That is when Vanning's living nightmare begins, one that culminates in his life on the run. He considers going to the police, but plays scenarios of being given the third degree over and over in his head and realizes that this could quite possibly make things much worse for himself and kill his dreams of a decent future. As the two storylines slowly come together, there is, of course, the question of the truth, but the true focus is on Fraser and Vanning, who just may epitomize the proverbial both sides of the same coin. 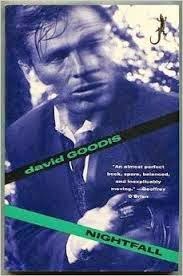 This is only the second Goodis novel I've read after Night Squad, but in comparison to other noir novels I've enjoyed, there seems to be something missing in the depth zone. When Goodis is inside the heads of Vanning and Fraser, the story is engaging, but as the story starts moving ever outward to the love interest, or to the violence of the three criminals, something seems to get lost here. It's not as dark as I would have expected given the author's reputation. That's not to say I didn't like it, and other Goodis fans may feel free to disagree, but it just didn't pack the gutpunch I'd expected. I was more upset at ruining my book than I was at all of the blood, but at least it's appropriate to reading crime fiction! I love it that you use sticky flags to mark things of interest like I do. My husband thinks I am crazy. I was interested in this review especially because I want to read this author but haven't tried one yet. Sorry about the blood on the book. I love sticky tabs! When I'm going back to write about the book, I can thumb through for quotations, etc, that I've marked. My husband finds them everywhere, though ... One time he was traveling for work and found one in his suitcase! I was crushed about ruining my book. And I'll be reading his Dark Passage coming up next -- hopefully it's a little better.